Phew, the Valentines are done and on their way to school. It was fun, but I'm so glad when they're finished and out of the house. This year we had decided to make chocolate dipped mini-pretzel sticks and package them up. Cha-Cha gave them out at preschool on Tuesday and then I procrastinated making the rest until last night. It's a good thing I did because The Boy came home with a letter from his teacher yesterday specifically prohibiting Valentines that included food items. Oi! Princess and Cha-Cha had a great time dipping and decorating about 100 pretzels. Oh, chocolate and sprinkles everywhere! Too fun! The Husband and the girls bagged them up while I made bag-toppers decorated with argyle hearts, the recipient's names and a simple Valentine message on the back. Pretty. 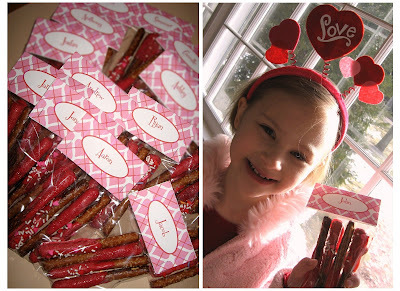 We scratched the pretzel idea for The Boy and gratefully adopted Design Mom's Mad Lib Valentine idea. It wasn't as simple as we thought it would be. Turns out Mad Libs aren't so easy to find 'round here. The Husband ran to four different stores finally returning with a stack. From there we had a bit of trouble again since the blind fill-in pages are on the back of the previous Mad Lib page. We decided to photocopy several of our favorite Mad Libs with their accompanying fill-in page onto festive red paper. It worked out well. We tied the tags on and were pretty happy with the results. The Boy was excited to give these out. I hadn't even known that he knew what Mad Libs were. He's thrilled to have several books of his very own to fill out now. Thanks Design Mom for the great idea! they're cute! we did "valentines are for dum dums" here. the boys thought it was funny! My valentines were never that cool. Cute ideas!